Our free plant clinic drop-off service is accessible any time the Arboretum is open (10:00 - 4:00 p.m. daily November-March, and 10:00 - 5:00 p.m. on weekends April-October). The Plant Clinic can also be reached by phone (215.247.5777,ext. 141), or email. Please fill out our Plant Clinic Form and attach it to your email for a faster response. Please leave questions and/or specimens with a staff member at the front desk in the Widener Visitor Center. All samples should include a description of your observations or concerns, an email address and/or a phone number. Please be sure your sample includes a significant amount of plant material, such as several branches with clusters of leaves, flowers, and/or fruits or seeds. This will assist in providing an accurate identification or diagnosis. Please avoid leaving inadequate samples, such as a single leaf or a bare branch. Also note that the plant clinic is unable to process soil or tissue samples. Diagnosis and response can take up to two weeks depending on the depth of the concern being handled. Contact the Plant Clinic at plantclinic@morrisarboretum.org or 215.247.5777 ext.141. Please fill out our Plant Clinic Form and attach it to your email for a faster response. 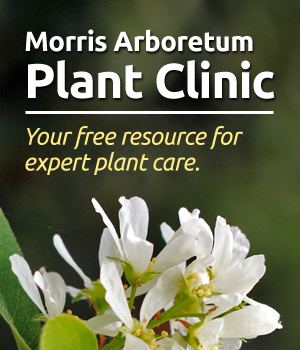 The purpose of the Morris Arboretum Plant Clinic is to provide general information and advice about plants to the general public. This service is not intended to provide technical expertise to be used for legal or commercial purposes. The Morris Arboretum cannot endorse any third party or external agency unaffiliated with the University of Pennsylvania, so please do not call to ask for recommendations for nurseries, arborists, etc.